Sandals are an important part of every men's footwear collection. 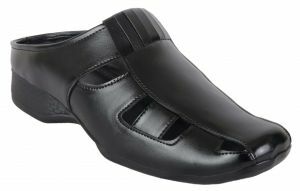 The reason why sandals for men are popular is because the amount of comfort that they offer without compromising on the style is simply unmatched. 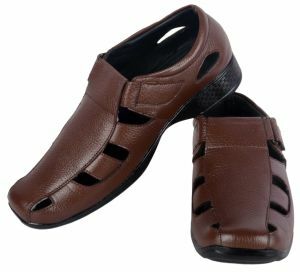 The best part about leather sandals for men is that they don't look too casual and at the same time give a soothing effect to your feet. When you are in a relaxed mood and are dressed in your casual best, a pair of leather sandals for men would simply compliment your relaxed attire. Browse through a range of sandals for men available at Rediff Shopping and make a choice based on your taste and requirement. 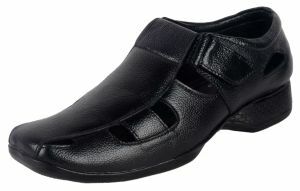 Rediff Shopping boasts of a wide variety of sandals for men within your budget. You can choose your sandals based on your favourite brand, colour, style, size and more. Our collection is truly large and has a lot of options in every category to choose from. From leather sandals to floaters for men, the list is simply endless. We have a pair for anyone and everyone looking for trendy sandals. Sandals are super comfortable and extremely light. They can be worn at any time of the year. The versatility and wearability is what make this footwear a huge hit among the youth. If you love to wear sandals with casual outfits, go for canvas, mesh or any other fabric sandals. However, if you wish to wear sandals with formal or ethnic outfits, opt for leather sandals for men, faux leather, suede leather and so on. Sandals and floaters are versatile and can be worn with a lot of outfits like cargo pants, shorts, trousers. However, make sure that you never wear a pair of socks along with sandals as this is the biggest fashion mistake. Also, avoid wearing sandals or floaters with a complete formal attire. You can choose sandals for men from brands like Bacca Bucci, Claude Lorraine, Alberto Torresi, Valentino, Lee Cooper and more, the quality is simply amazing.